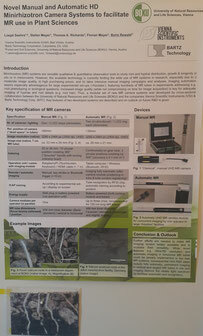 We just successfully introduced our manual and automatic UHD-root cameras to a broad range of international root and rhizosphere researchers at the 10th Symposium of the International Society of Root Research (ISRR10), held in Israel July 8-12. 2018. We very much enjoyed the conference including fruitful discussions on the specs and future developments of MR cameras. We hope to see you at the ISRR11 in Missouri, USA in 2021!